STUDIO LEGOHEAD: Introducing The Rex!! This weekend me and Ben went back to Luton. 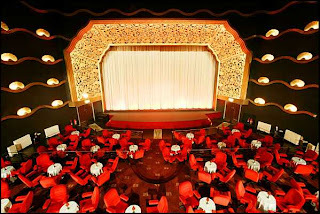 We were invited to The Rex cinema in Berkhamstead by our buddies, Andrew, Rachael, Neil and Sarah. They had all been to this wonderful cinema and wanted us to experience it's delights. As you can see from the pics it's pretty spectacular. We watched The Orphanage (spanish horror film) and although we had seen it once before it was well worth a second viewing in these wonderful surroundings.